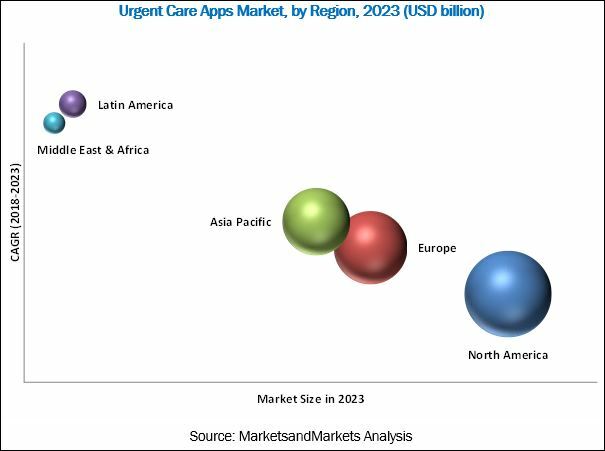 [141 Pages Report] The urgent care apps market is expected to reach USD 2,515.1 million by 2023 from USD 446.8 million in 2018, at a CAGR of 41.3% during the forecast period. The base year considered for the study is 2017 and valued at USD 333.8 million in 2017 and the forecast period is from 2018 to 2023. To define, describe, segment, and forecast the global urgent care apps market by type, clinical area, and region. To forecast the size of the urgent care apps market in North America, Europe, Asia Pacific (APAC), Latin America, and the Middle East & Africa. To provide detailed information about factors influencing market growth (drivers, restraints, opportunities, and industry-specific challenges). To analyze micromarkets with respect to individual growth trends, prospects, and contributions to the overall market. To analyze market opportunities for stakeholders and provide details of the competitive landscape for key players. To profile key players in the urgent care apps market and comprehensively analyze their core competencies2 and market rankings. To track and analyze competitive developments such as acquisitions, product launches, collaborations, partnerships, and agreements in the market. Some of the prominent players in this market are Allm (Japan), Pulsara (US), Vocera Communications (US), PatientSafe Solutions (US), Voalte (US), Twiage (US), TigerConnect (US), Imprivata (US), Siilo (Netherlands), Forward Health (UK), Hospify (UK), Argusoft (US), Alayacare (US), Pivot Design Group (Canada), Medisafe (US), Smartpatient (Germany), and Johnson & Johnson (US). The urgent care apps market is projected to reach USD 2,515.1 million by 2023 from USD 446.8 million in 2018, at a CAGR of 41.3%. The growth of this market is influenced by a number of factors, such as the increasing penetration of smartphones, growing penetration of 3G and 4G networks, rising focus on patient-centric healthcare delivery, and the benefits offered by urgent care apps. The report analyzes the urgent care apps market by type, clinical area, and region. On the basis of type, the market is segmented into pre-hospital emergency care & triaging apps, in-hospital communication & collaboration apps, and post-hospital apps. In 2017, the post-hospital apps segment accounted for the largest share of the market. The large share of this segment is mainly attributed the rising awareness of mobile apps to manage medications among patients and increasing demand for medication management & rehabilitation apps due to increasing number of stroke, trauma, and cardiac patients who need rehab support during post-hospital care. Based on clinical area, the market is classified into trauma, stroke, cardiac conditions, and other clinical areas. The trauma segment is expected to account for the largest share of the urgent care apps market in 2018. The increasing number of road accident across the globe is driving the growth of this segment. As the awareness to address trauma is increasing due to continuous efforts by health organizations, such as WHO, the adoption of apps to manage trauma and casualty among paramedics and emergency centers is also growing. In 2018, North America accounted for the largest share of the market, followed by Europe. The large share of North America is attributed to the implementation of patient data safety regulations in the region, improving quality of care, increasing internet speeds, the need to reduce escalating healthcare costs, and a growing focus on patient-centric healthcare delivery. However, the usage of consumer instant messaging apps and high volume of miscategorized apps on Android and Apple stores are the key challenges for the growth of this market. Prominent players in this market are Allm (Japan), Pulsara (US), Vocera Communications (US), PatientSafe Solutions (US), Voalte (US), Twiage (US), TigerConnect (US), Imprivata (US), Siilo (Netherlands), Forward Health (UK), Hospify (UK), Argusoft (US), Alayacare (US), Pivot Design Group (Canada), Medisafe (US), Smartpatient (Germany), and Johnson & Johnson (US).